As any musician knows, in order to achieve perfect notes it is important to have a high-quality instrument. The violin bow is the most essential part of the violin. The right bow will hold the key to produce a rich and beautiful sound. However, there are numerous styles of violin bows to choose from that are made from a wide range of materials. Like cars, they come in a huge range of models with price tags to match. If you are looking for a classic wooden bow, you will want to settle for nothing but the best. 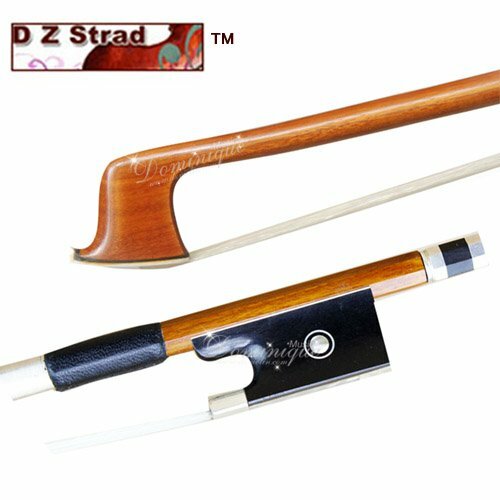 D Z Strad has created a first-rate violin bow made from Pernambuco wood. This type of wood is famous among music lovers for being the best wood for violin bows. This full sized bow comes complete with an ebony frog with an attractive fleur-de-lis decal. This helps to make the bow stand out from the crowd and adds a touch of class. But this bow is not just a pretty face. The Pernambuco wood helps to provide the bow with impressive resilience and tensile strength. The ribbon of this model features grade A Mongolian/Syrian horsehair for enhanced durability. 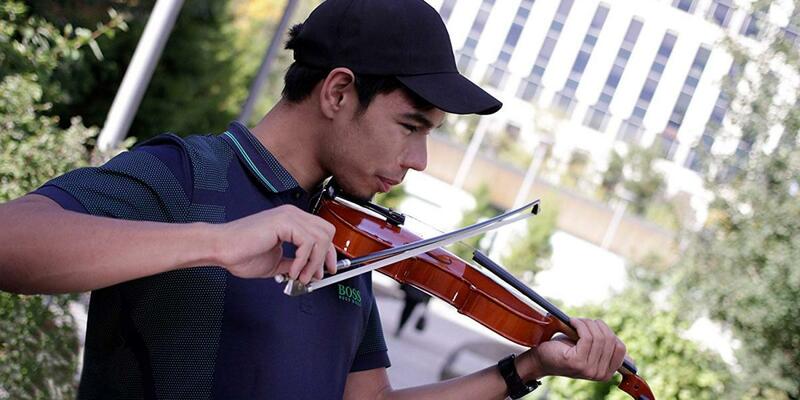 The bow is very well balanced and will help players to deliver smooth performances with very distinguished nuances. Violinists are sure to feel proud to use this bow while they play there instrument. The top quality materials are sure to satisfy professionals and anyone with a passion for music. Made from genuine Pernambuco wood. Ribbon with grade A Mongolian horsehair. Might be a little too stiff for beginners. Are you ready to go pro? Then it is time for a professional violin bow that will go the distance. 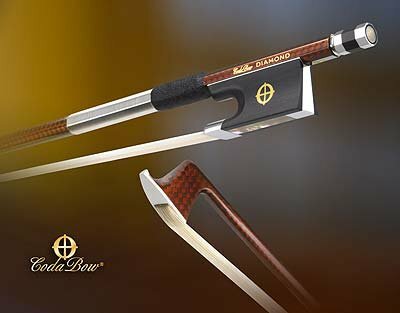 People who are looking for a master crafted bow that really delivers should check out the CodaBow Diamond GX Carbon Fibre 4/4. This fine performance carbon graphite bow has been created to the highest standards. The extremely strong carbon fiber is coupled with a Kevlar acoustic core to produce a very warm and robust sound. The bow is fully handcrafted and features exquisite detailing. The bow’s ebony frog has been designed by Walter Paulus and is a mark of unwavering quality. Each bow is also individually numbered, which makes this a real collector’s item. For any musician, purchasing a top quality instrument is a real investment. Fortunately, the CodaBow Diamond GX Carbon Fibre 4/4 comes with a lifetime warranty. This well may be the last bow you will ever need. Perfectly balanced for a high response. Top quality carbon graphite bow. Boasts a sleek diamond weave finish. A little too long for standard violin cases. Most music students are taught that a violin bow needs to be made of wood. However, Glasser is here to break the rules. The Glasser X-Series Carbon Graphite X-Bow provides the same great quality as a wooden bow but comes with a few extras. This model boasts a solid quality and comes with an attractive matt finish. It is lightweight, which delivers smooth playability. The genuine horsehair used in the ribbon produces a much more pleasant sound compared to synthetic fibers. The molded carbon graphite material makes this an excellent budget bow for beginners and practice sessions. The bow is lighter than usual, which means that some players will find it easier to use. However, this means that a little extra pressure needs to be applied to dampen the bright sound. The round stick is also ideal for those who are just getting started. The bow features faux pearl eyes that serve as an attractive stylistic feature. However, it should be noted that this bow is extra-long. While this does not affect playing, it means that it is a little long for most violin cases. This can prove to be a real inconvenience, and it is a good idea to measure your violin case before purchasing. Created using patented graphite molding technology. Comes with a round stick. Boasts attractive faux pearl eyes. A little long for standard violin cases. The tension control is very sensitive. Need to rosin to personal taste. Are you just joining the wonderful world of violin playing? You will want to select a violin bow that is easy to use and supple. However, it should also be easy to hold so that novices can get to grips with it. At 60 grams, the Fiddlerman Carbon Fiber Violin Bow 4/4 is a little lighter than most professional bows. This makes the bow very comfortable for practicing. It is also perfect for rapid staccato playing and can be comfortably used for several hours at a time. This handmade bow is very well balanced and features a nice arch. But, what does this actually mean? In broad terms, violinists will receive extra bounce. The ribbon boasts high-quality Mongolian horsehair to produce a professional grade sound. Not only does the bow handle well, but it also produces minimal hiss and hold the rosin very well. Regarding the rosin, the bow will need to be rosined well before it is ready for use. Players are likely to find that it takes a few sessions before the warm and rounded sound they are used to is achieved. However, once the bow is ready to go, it will produce an appealing sound for a long time to come. Ideal for rapid staccato playing. Responds well the heat and humidity. Needs to be rosined well. Takes time to break it in. Does a violin bow really need to be expensive to be any good? This is certainly a point that Crescent would contest and they have made their mark with the A8035. But, is it actually any good? 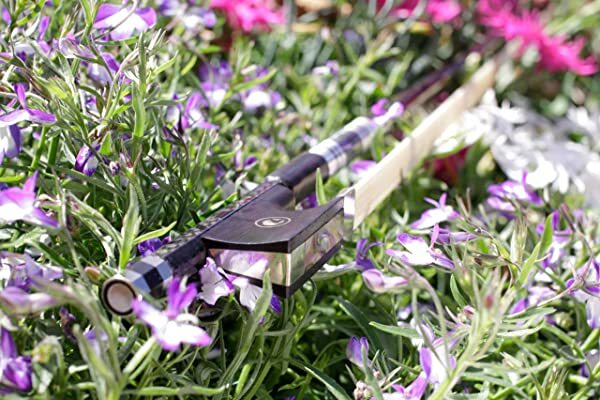 The A8035 violin bow has been made with very high-quality materials. The carbon fiber frame is designed to be very durable and will not warp in humid conditions. The bow also features a round stick, which is the style of choice for beginners. 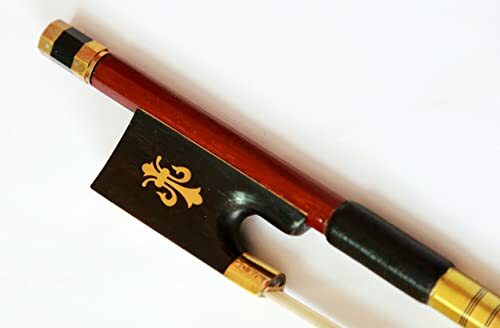 The frog of the bow is made of genuine ebony that is set with Parisian eyes. The ribbon boasts is made from horsehair that holds the rosin well. There is even abalone shell inlay on the frog slide that serves as a nice decorative touch. While this is not a top of the range bow, it is perfect for beginners. Because the bow is not as bright as many other options, it tends to be more forgiving. 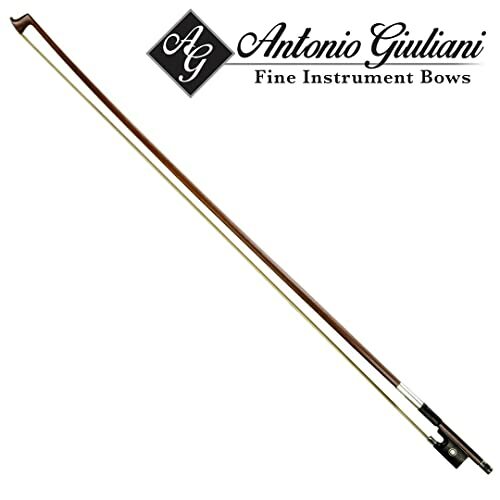 People who are looking for a practice bow that will go the distance should check out this model. Set with a cheap rubber grip. Not as precise as other models. Is it possible to cut corners in terms of cost without compromising on quality? The Vio Music Team certainly seem to think so. 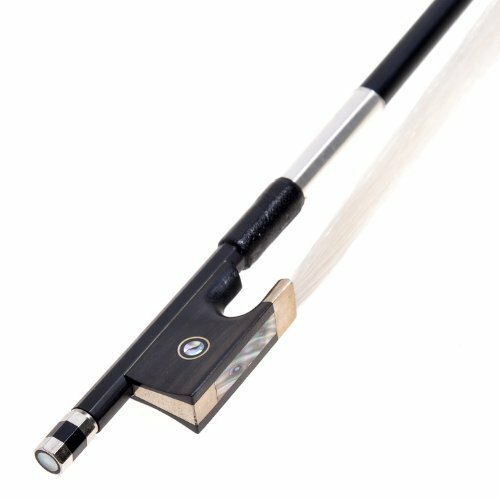 The Silver Winding Violin Bow promises to deliver an excellent sound without breaking the bank. At first glance, this bow is sure to satisfy. It is made of Brazilwood and features Mongolian horsehair in the ribbon. There are also plenty of other style features such as the attractive Fleur-de-lis inlay ebony frog, silver winding, and golden mount. But, how does it sound? Unfortunately, this is where the bow falls a little short. The sound that it delivers is rather raspy and shrill. 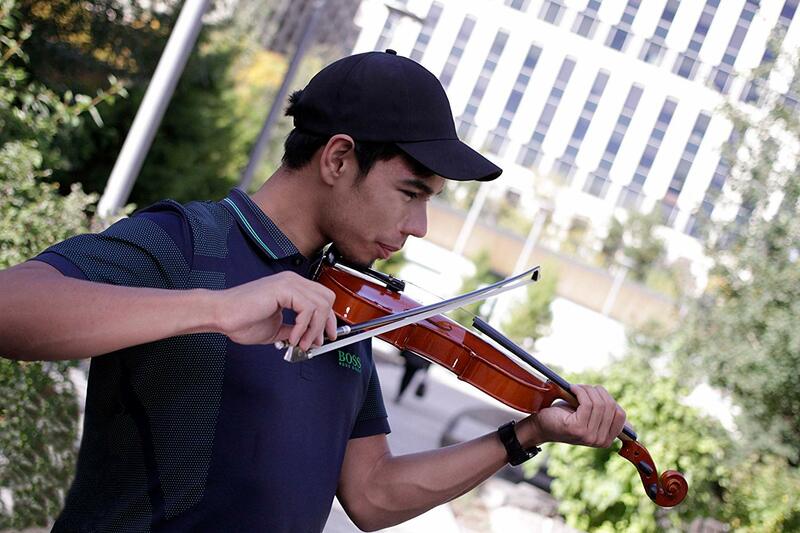 People who have just started to play the violin are unlikely to notice the finer nuances of sound. It takes a lot of practice to sound like a professional, and this bow is a good starter model. If you are playing in a rowdy bar and do not want to risk your top of the range bow, this is a great option. It is also ideal for practicing at home. However, people who are playing at a special concert will probably want to leave it at home. Tends to produce shrill and raspy sounds. 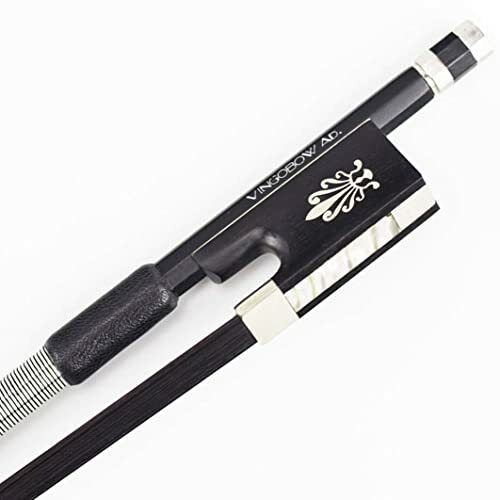 At first glance, the VingoBow Carbon Fiber Violin Bow really impresses. It is handcrafted and comes with an ebony frog. The frog is set with Parisian eyes as well as a mother-of-pearl slide. But, is this just a pretty face? The bow is comfortable to hold and features a great curve. It is designed with good strength as well as flexibility and balance. However, this is top a top of the range bow, and as such there are likely to be certain shortcomings. One of the most noticeable of these is the horsehair in the ribbon. This hair has been cut very short, which means that it cannot be lengthened if desired. People who do not need to lengthen the hair will be able to get a good sound out of this bow. It is ideal for practicing with and delivers a warm tone that is also deep. Just don’t expect it to work wonders. Produces a deep and warm tone. Not possible to loosen the bow. Do you prefer a heavy bow to make sweet music with? The extra weight of this model from Kennedy Violins is ideal for people who are learning to play the violin. However, professionals are likely to find that the extra weight dulls the nuances of certain tones. In terms of style and build, Kennedy Violins has made a good effort. It is made of solid Brazilwood and comes complete with an ebony frog that is fully metal-mounted. In terms of bounce and responsiveness, it manages to rise to the occasion well. The ribbon features Mongolian horsehair that is known for its strength and durability. However, because the hair is not fully threaded, it is likely to need replacing more quickly than usual. It should be noted that the bow comes pre-rosined. This means that violinists will not be able to choose their own type of rosin. However, a little extra rosin still needs to be applied before the bow is ready for use. Features a genuine ebony frog. A bit heavier than standard bows. Need to apply extra rosin before it can be played. The bow hair is not fully threaded. 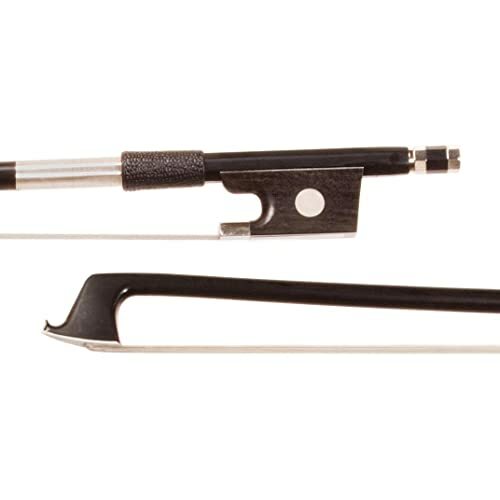 In terms of musical clarity, this violin bow from Ace Music is an excellent product. The bow is very well balanced and is made from high-quality carbon fiber. It also comes with a number of special touches such as a frog with a heavily embellished ebony Parisian eye. Like with much more famous models, the ribbon boasts white Mongolian horsehair. In order to deliver sweet tones, the bow features a high pressure treated carbon fiber core. It comes with a supple shaft that has been perfectly calibrated to achieve a perfect balance point. The bow comes complete with special rosin that needs to be applied before it is ready for use. While this task is not difficult, it may be a little tricky for novices. However, once the rosin has been applied violinists will be ready to start working their magic. Comes with an impressive arch. Premium quality carbon fiber design. Features a heavily embellished ebony Parisian eye. Features ethically sourced Mongolian horsehair. Needs to be rosined before use. Does not stand up well to humidity. Are you looking for a very light bow? 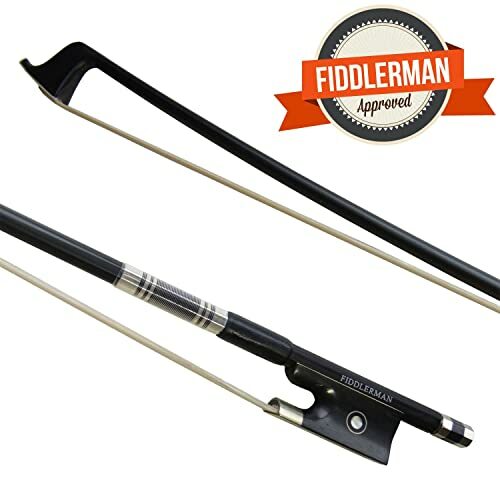 At just 58 grams, Fiddlerman has created one of the lightest bows around. In fact, this bow seems to virtually dance across the strings and delivers fantastic speed and agility. Fiddleman has dared to be different in terms of material. This model is made of a combination of both carbon fiber and wood. This helps to attribute to the lightness and high sound quality. Young learners and those who have small hands are sure to appreciate the narrow girth of the bow. This means that the bow can be comfortably used for several hours at a time. It is also much less demanding than many other models and beginners will find it slightly easier to get to grips with this model. The overall design of the violin bow is sure to appeal to style lovers. It comes with a natural abalone inlay that is used for the ebony frog. It also boasts a solid-looking steel screw and winding. May be too light for beginners. Not as flexible as other models. The supplied rosin is not very high quality. They say a craftsman is only as good as their tools. The same applies when it comes to music. Violin players who want to produce sweet music will need to search for the best violin bows. Violin bows are typically made of Pernambuco, Brazilwood, synthetic material, or carbon fiber. The material that you choose will have a significant impact on the price and playability of the violin bow. Brazilwood covers several different types of wood that come from the tropical forests of Brazil. Brazilwood is typically cheaper than many other types of materials. This makes it a good choice for students and practice bows. People who have their heart set on a wood bow will find that Pernambuco is the best choice. This type of wood is lightweight and strong and delivers versatile playability. Carbon fiber bows have become very popular in recent years due to the fact that it is typically sturdier than wood. Another benefit of carbon fiber bows is that they stand up well to humidity and temperature changes. Unlike organic materials, carbon fiber bows do not tend to warp. Although usually lower quality than other options, violin bows made of fiberglass or composites are very durable. People who are just getting started should probably go for a synthetic bow before moving on to more expensive choices. This is the easiest factor to determine. The size of the violin bow you choose should match the size of your violin. Violin bows are either octagonal or round. Most people tend to prefer round bows because they are not as stiff and allow enhanced control. However, some players prefer stiffer bows and will tend to choose one that is octagonal. The weight of the bow will affect the tone of the violin’s sound. Heavier bows typically create a bigger sound. However, lighter bows have the benefit of making different bow strokes more facile. 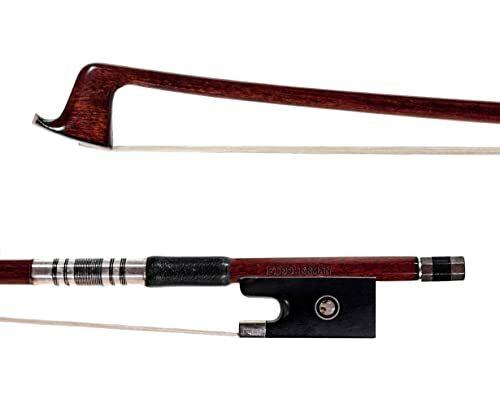 The bow weight that a musician chooses will largely depend on personal preference. Most violinists will try several different bows of different weights to find the one that is the best fit for them. Rather than the weight of the bow, the more important consideration is the balance. It is essential to make sure that the bow is not warped because this will have a negative effect on the balance. There must be no twisting or bending near the tip of the bow. 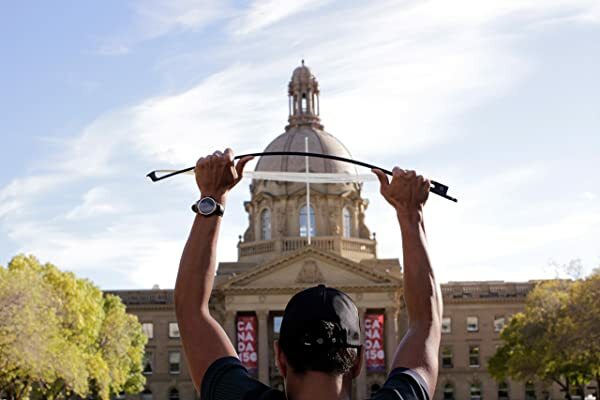 Last but not least, flexibility determines how the bow will react when it is under tension. When a violinist tightens their bow, it should have some bounce and give to it. This will serve to make various types of articulation easier to attain. So, What're The Best Violin Bows? 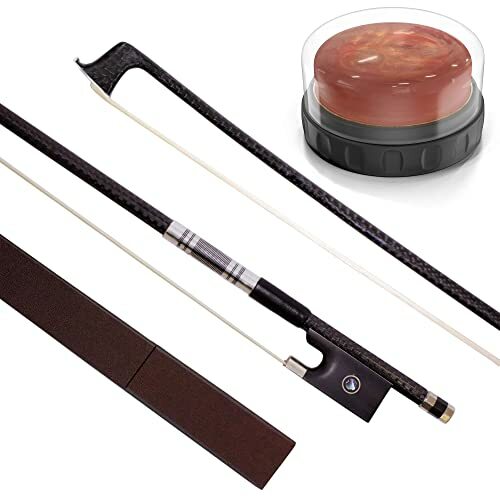 This professional violin bow is made of high-quality carbon fiber and provides a whole host of features that are sure to impress. While this bow is a bit of an investment, it comes with a lifetime warranty. This means that this bow will never need to be replaced.